The AERO cabinet program is a modular approach that allows you to configure a custom cabinet: choose the cabinet size and then add storage options to suit your needs. This Aero 76 LP Storage Cabinet has adjustable wood shelves, a removable back panel for wire management, a passive heat ventilation system and a swivel bin that protects records when closed and displays them when open. Bin protects records when closed and displays them when open. 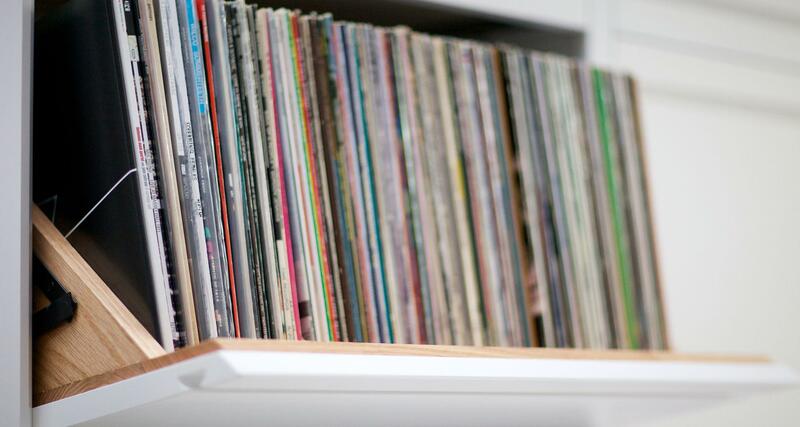 Dual-pivot hinge balances the weight of records, even when the bin is full. (3) LP bins, each holds approximately 120 LPs. Aero comes in thousands of configuration options. Add additional cabinet sizes and storage options to customize your entertainment system to suit your needs.